Days before the 2016 Los Angeles International Auto Show opening, as some of the industry’s biggest names were eager to reveal their latest achievements, Automobili Lamborghini stole the show before it ever began. For months, anticipation has been brimming to capture just a single glimpse of the newest V10 expression born of Sant’Agata Bolognese. And on November 15, once the sun set over the idyllic Pacific Palisades, Lamborghini transcended every expectation as the Huracán RWD Spyder, the purest combination of open air driving and rear-wheel drive thrills, was revealed to the world. 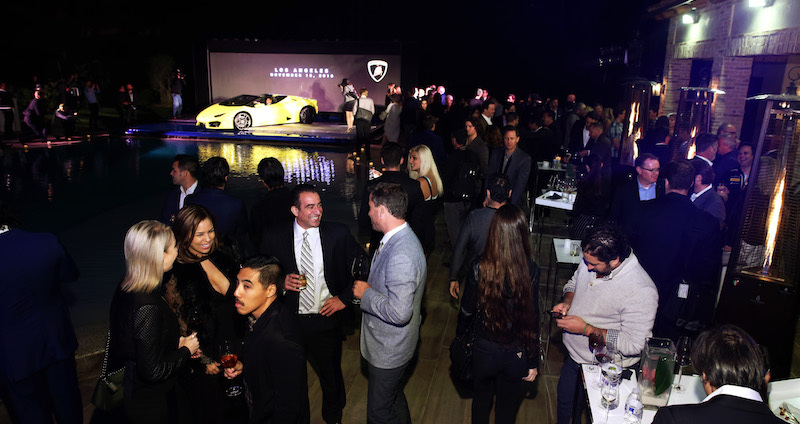 For the invite-only event, Lamborghini took residence of an illustrious, Mediterranean inspired property on a private estate above the coastal Los Angeles neighborhood. When guests entered the Palladian residence, they were greeted by a breathtaking enchantment, including a brilliant tri-color display of Huracán models on the front drive. Once inside, a covered vehicle transcended motion, floating above the serene infinity pool and demanding the attention of curious eyes. Tangible anticipation was in the air as special guests, celebrities (actor Jesse Metcalfe pictured at left), media and Lamborghini executives watched waves crash behind on the 30 foot digital display, awaiting the model’s reveal. Once the evening dimmed to night and the lights of the property began to glisten, whispers turned to silence as Automobili Lamborghini Chairman and Chief Executive Officer, Stefano Domenicali commanded the stage. Pulling back the cover to finally present the Huracán RWD Spyder, the fourth model in the highly-lauded V10 lineup was met with enthusiastic applause. This particular model in “Giallo Tenerife” color, also showcased a special interior in Forged Composite. The lightweight material accents, available as an option, enhance appearance. A manifestation of Lamborghini’s pure power, the perfectly sculpted exterior and naturally aspirated V10 engine of the Huracán range provides an unrivaled driving experience that leaves the road trembling in its wake. The RWD Spyder is no different, combining the best of two worlds to produce the purest of open-air driving capabilities and dynamic rear-wheel-drive performance.